The Green Way To Go. The Green Way To Go., a photo by Davidap2009 on Flickr. At the New forest show on what must have been the hottest day this year I saw a stand by a local funeral director. I was surprised by the diversity of choice and admit to a little morbid fascination. A little macabre. But what a cool way for a cycle enthusiast to go to his or her last resting place. 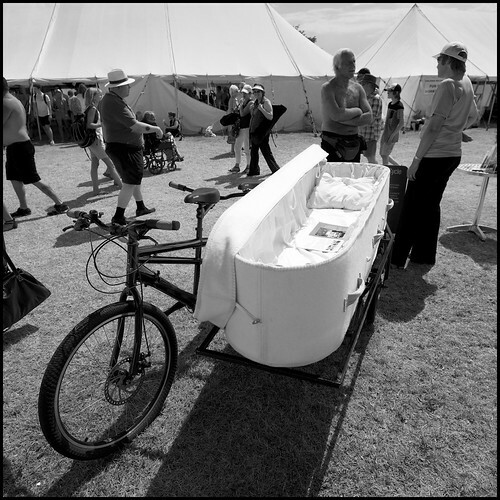 No emissions and even the coffin is a thick blanket like material. You wouldn’t want the coffin to be too heavy. Pity the 2 riders who’d have to pedal that over a distance and up hills.